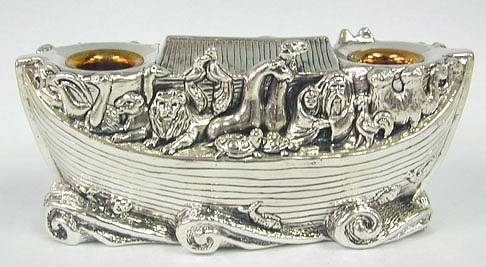 NoahÂ´s Ark Candlesticks A superb artisan 925 sterling silver (NOT silver plated) Noah ark Sabbath candle holders, Judaica. 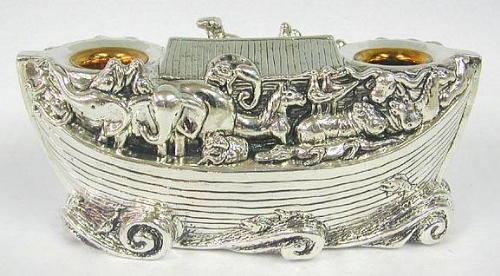 Beautifully designed as an highly detailed Noah ark in the sea, depicting Noah and his wife as well as various animals including elephants, horses, cats, birds, goats, lions, tigers, turtles, etc. The two candle sockets are gilded (gold washed). This item was made in the electroforming method. Measurements : Marks : Height: 3in. / 7.62cm. Length: 2in. / 5.08cm. Width: 6.2in. / 15.748cm. 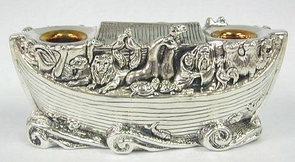 1 inch = 2.54cm 925 for sterling silver. Weight : 441gr. / 14.178oz.